"TSX" redirects here. For other uses, see TSX (disambiguation). The Toronto Stock Exchange (often abbreviated as TSX) is a stock exchange in Toronto, Ontario, Canada. It is the 9th largest exchange in the world by market capitalization. Based in the Exchange Tower in Toronto's Financial District, the TSX is a wholly owned subsidiary of the TMX Group for the trading of senior equities. A broad range of businesses from Canada and abroad are represented on the exchange. In addition to conventional securities, the exchange lists various exchange-traded funds, split share corporations, income trusts and investment funds. More mining and oil and gas companies are listed on Toronto Stock Exchange than any other stock exchange. The Toronto Stock Exchange likely descended from the Association of Brokers, a group formed by Toronto businessmen on July 26, 1852. No records of the group's transactions have survived. It is however known that on October 25 1861, twenty-four brokers gathered at the Masonic Hall to create and participate in the Toronto Stock Exchange. Between 1852 and 1870, two other distinct, commodity-orientated, exchanges were founded : the Toronto Exchange in 1854 and the Toronto Stock and Mining Exchange in 1868. Initially the TSE had 13 listings but it grew to 18 in 1868 (a majority of bonds and bank's issues). Many banks of Upper Canada failed during 1869, which halted any sort of trading in the city as the market was just too small. A bull market in 1870 boosted investor's confidence and eight of the original 24 brokers joined again to re-establish the TSE. :5 The exchange was incorporated by an act of the Legislative Assembly of Ontario in 1878.. The Art Deco façade of the former Toronto Stock Exchange building, now incorporated into the Toronto-Dominion Centre. Frieze by artist Charles Comfort. The TSE moved on Bay Street in 1913 and in 1937 opened a new trading floor and headquarters in an Art Deco building, still on Bay. By 1936, the Toronto Stock Exchange grew to become the third largest in North America. In 1977, it launched the TSE 300 index and introduced the CATS (Computer Assisted Trading System), an automated trading system, and began to use it for the quotation of less liquid equities. In 1983, the TSE vacated its Art Deco headquarters on Bay Street and moved into the Exchange Tower. The old TSE building later became the Design Exchange, a museum and education centre. On April 23, 1997, the TSE's trading floor closed, making it the second-largest stock exchange in North America to choose a floorless, electronic (or virtual trading) environment. In 2001, the Toronto Stock Exchange acquired the Canadian Venture Exchange, which was renamed the TSX Venture Exchange in 2002; this resulted in the creation of a parent to the TSX, the TSX Group. This ended 123 years of the usage of TSE as a Canadian stock exchange. On May 11, 2007, the S&P/TSX Composite, the main index of the Toronto Stock Exchange, traded above the 14,000 point level for the first time ever. On December 17, 2008, for the first time in TSX history, the exchange was closed for an entire trading day due to a technical glitch. On February 9, 2011, the London Stock Exchange announced that it had agreed to merge with the TMX Group, Toronto Stock Exchange's parent, hoping to create a combined entity with a market capitalization of $5.9 trillion (£3.7 trillion). Xavier Rolet, who is CEO of the LSE Group, would head the new enlarged company, while TMX Chief Executive Thomas Kloet would become the new firm president. Based on data from December 30, 2010 the new stock exchange would have been the second largest in the world with a market cap 48% greater than the Nasdaq. 8 of the 15 board members of the combined entity will be appointed by LSE, 7/15 by TMX. The provisional name for the combined group would be LTMX Group plc. About two weeks after Maple Group launched a competing bid the LSEG-TMX deal was terminated after failing to receive the minimum 67% voter approval from shareholders of TMX Group. The rejection came amidst new concerns raised by Bank of Canada governor Mark Carney regarding foreign control of clearing systems and opposition to the deal by Ontario's finance minister. On June 13, 2011, a rival, and hostile bid from the Maple Group of Canadian interests, was unveiled. A cash and stock bid of $3.7 billion CAD, in hopes of blocking the LSE Group's takeover of TMX. The group is composed of the leading banks and financial institutions of Canada. In March 2015, a competing exchange, Aequitas Neo, opened for trading, listing 45 issues that had been listed only on the TSX. The new exchange aims to focus on fairness, specifically regarding what it refers to as "predatory high-frequency trading practices". The exchange plans to list additional TSX-listed securities. The exchange has a normal trading session from 09:30am to 04:00pm ET and a post-market session from 4:15pm to 5:00pm ET on all days of the week except Saturdays, Sundays and holidays declared by the Exchange in advance. As of December 2017, Toronto Stock Exchange had 1,501 listed issuers (including ETFs and other structured financial products) with a combined market capitalization of CAD $2,968,589,908,968. The exchange is home to all of Canada's Big Five commercial banks—Canadian Imperial Bank of Commerce (CIBC), Bank of Montreal, Bank of Nova Scotia, Royal Bank of Canada and the Toronto-Dominion Bank—making the exchange the centre for banking in the country. This was seen as being most evident during the proposed mergers of Royal Bank with Bank of Montreal, and CIBC with the Toronto-Dominion Bank in 1998. Then Finance Minister Paul Martin blocked the mergers to preserve competition. The exchange is the primary listing for several energy companies including; Cameco, Canadian Natural Resources, Encana, Husky Energy, Imperial Oil and Nexen all within the top 40 companies listed in on the exchange. Many of the large companies listed on the TSX, especially those on the S&P/TSX 60 index, have a secondary listing on an American exchange such as the New York Stock Exchange. ^ "TMX - Senior Management". tmx.com. ^ "Statistics" (PDF). www.tmx.com. March 2017. 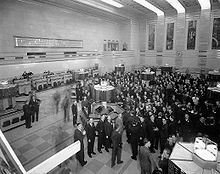 ^ a b c d e f g h i "Timeline: 160 years of the Toronto Stock Exchange". Financial Post. Retrieved 2018-09-23. ^ a b c Martin, Joe. "How Toronto Became the Financial Capital of Canada: The Stock Market Crash of 1929" (pdf). Rotman School of Management, University of Toronto. ^ a b Taylor, Doug. "Toronto's architectural gems–the Design Exchange (The original Toronto Stock Exchange)". Historic Toronto. Archived from the original on 17 March 2015. Retrieved 17 March 2015. ^ "LSE, Toronto exchange in "merger of equals"". 2011-02-09. ^ "Merger Of Equals Will Make Deal More Palatable For Canada Govt". 2011-02-09. Archived from the original on February 11, 2011. ^ Erman, Boyd; Howlett, Karen (2011-06-29). "Shareholder reject proposed merger of TMX and LSE". The Globe and Mail. Toronto. ^ Erman, Boyd (2011-06-28). "What did Bank of Canada really say about TMX-LSE?". The Globe and Mail. Toronto. ^ "TMX Group Equity Financing Statistics – December 2017 (Revised)". TMX Group. Wikimedia Commons has media related to Toronto Stock Exchange.